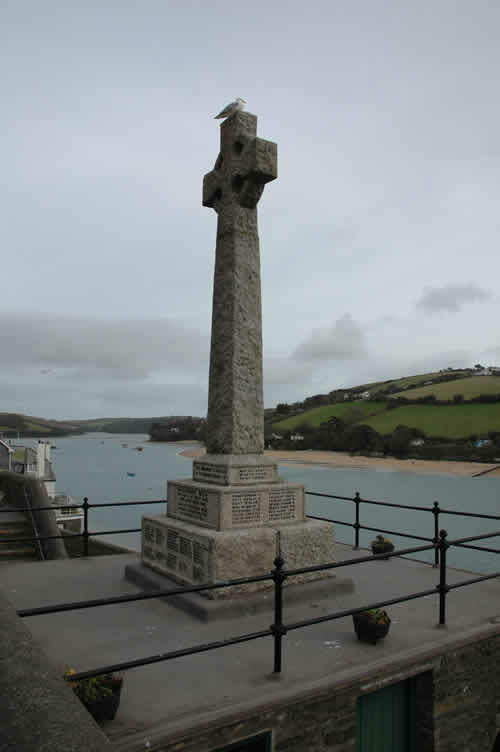 In a glorious position, the memorial at Salcombe commemorates victims of the bombing of Salcombe, the lost lifeboat crew and men from both wars. 5592 Private John Adams Ball of the 2nd Regiment, the South African Infantry. Son of Catherine and the late Captain J. J. Ball. Born in Salcombe in 1896. Died 23 January 1916 aged 21. He was a South African citizen. 2nd Lieutenant John Ernest Calkin of the 22nd (Tyneside) Battalion, the Northumberland Fusiliers. Son of John Ernest and Elizabeth Calkin of Salcombe. Born in Southampton in 1892. Died 9 April 1917 aged 25. 329222 Gunner Arthur James Canham of 192 Siege Battery, the Royal Garrison Artillery. Son of Frances Canham and the late James of Harvey's Row, Salcombe. Born in Salcombe in the June Quarter of 1896. Died 16 August 1917 aged 21. Major Maxwell Montague Carpendale of the 36th Jacob's Horse Regiment. Son of Ellen Carpendale and the late Colonel Montague, also of the 36th Jacob's horse; husband of Catherine Carleton Carpendale. Born 12 July 1883 in Mussorie, India, Died 14 October 1918 aged 35. Awarded the Military Cross in July 1916. 874979 Chief Writer Awdrey Lawrence Cove of the Mercantile Marine Reserve, HMS Lauentic. Son of Philip and Edith Cove of Herbert Road, Salcombe. Born in Salcombe in the June Quarter of 1898. Died 25 January 1917 aged 19. 41941 Pioneer Marice Henry Dare of the 68th Field Company, the Royal Engineers. Son of Edwin and Isabella Dare; brother of Thomas (below). Born in Salcombe in 1893. Died 15 August 1915 aged 22. 27878 Private Thomas Dare of the 15th Battalion, the Canadian Infantry (Central Ontario Regiment). Son of Edwin and Isabella Dare; brother of Maurice (see above). Born in Salcombe 9 July 1880. Died 6 June 1916 aged 36. DA/22153 Deckhand William Percy Distin of the Royal Navy Reserve, HMS Pembroke. Son of James and Mary Distin of "Beadon", Salcombe. Born in Salcombe in 1899. Died 1 November 1918 aged 19. 4791 Private Richard Evans of the 2/7th Battalion. the Worcestershire Regiment. Son of Thomas and Anne Evans of Salcombe. Born in Salcombe in 1895. Died 10 October 1916 aged 21. Captain Douglas Cameron Foster of the Cameronians (the Scottish Rifles). Son of Brigadier Turville Foster and his wife, Madeleine Foster, of Salcombe. Born in Aldershot in 1891. Died 14 April 1917 aged 26. Lieutenant Arthur Frederick Halstead of the 15th Battalion, the Rifle Brigade, att. to the 1st Battalion, the Dublin Fusiliers. His father, also called Arthur Frederick Halstead, became the Chief Mechanical Engineer of the Cordoba & Rosario Railway in Argentina and married Mary Elizabeth King there 14 June 1892 in St John's Anglican Cathedral in Buenos Aires. "Frederick" their only son was born in Argentina in August 1893. Died 28 June 1918 aged 25. 99221 Gunner Albert Berry Hodder of 266 Siege Battery, the Royal Garrison Artillery. Son of Ann Hodder (widow). Born in Salcombe in 1887. Died 20 April 1917 aged 30. 18893 Private William Jarvis of the 2nd Battalion, the Devonshire Regiment. Husband of Emily Jarvis of Island Street, Salcombe. Born in Galmpton in 1883. Died 27 September 1918 aged 35. 8/1081 William Jarvis of the 33rd Battalion, the Training Reserve. Son of William and Fanny Jarvis; husband of Amelia Jarvis of Batson, Salcombe. Born in Malborough in 1884. Died 6 February 1917 aged 31. Buried in Salcombe Cemetery. 329340 Driver Thomas Benjamin Victor Larcombe of the 159th (Heavy) Battery, the Royal Garrison Artillery. Son of Joseph and Martha Larcombe of Salcombe. Born in Crewkerne, Somerset in 1895. Died 15 May 1917 aged 24. K/14459 Stoker 1st Class James Alfred Lethbridge of the Royal Navy, HM Mine Sweeper Kinross. Son of Thomas and Elizabeth Lethbridge of Salcombe. Born in Salcombe 28 February 1894. Died 16 May 1919 aged 24. 24444 Private Edwin Clarence Paige Adams of the 55th Battalion, the Machine Gun Corps. Son of Edwin and Mary Ellen Adams. Born in Salcombe in the June Quarter of 1894. Died 28 April 1918 aged 23. Captain Lewis Moysey of the Royal Army Medical Corps. Husband of Frances Amelia Moysey. Born in Leytonstone in 1870. Died 26the February 1918 aged 48. Formerly practised as a physician and surgeon in London. 2512 Private John Murch of the 5th (Prince of Wales) Battalion, the Devonshire Regiment. Son of Thomas and Mary Ann Murch, Born in Holne in the December Quarter of 1893. Died 22 November 1915 aged 22. 622038 Private Samuel Patey of the 31st Battalion, the Canadian Infantry (Alberta Regiment). Son of Sarah Patey and the late John Patey of Fore Street, Salcombe. Born in Hallsands in 1891. Died 14 June 1916 aged 25. Emigrated to Canada in May 1913. A Canadian citizen. 99237 Gunner Edward James Penny of the 266th Siege Battery, Royal Garrison Artillery. Son of Sarah Penny of Salcombe; husband of Bertha Mary Penny of Courtney Street, Salcombe. Born in Dodbrook, Kingsbridge in 1883. Died 20 April 1917 aged 34. 328285 Driver Philip Alfred Putt of the 159th Heavy Battery, Royal Garrison Artillery. Son of Philip and Jane Putt of Church Street, Salcombe. Born in Salcombe in 1899. Died 25 November 1917 aged 18. Buried in Salcombe Cemetery. 267 Gunner Roland Putt of the 1st/2nd devon Heavy battery, the Royal Garrison Artillery. Son of Frederick and Mary Putt of 15 Buckley, Salcombe. Born in Salcombe in 1899. Died 9 April 1916 aged 17. Buried in Salcombe Cemetery. 10408 Private Nicholas Henry Spry of "C"Coy, 8th Battalion, the Devonshire Regiment. Son of Edith Spry of Crowther's Hill, Dartmouth and the late William Spry. Born in Malborough in 1897. Died 25 September 1915 aged 18. Captain Alexander Lynham de Courcy Stretton of the 1st Battalion, the Lancashire regiment, att. to the 1st Battalion, the Nigeria Regiment. Son of *Captain William de Courcy Stretton (Ret) (see below) of Little Close, Salcombe and his wife Beata Stretton (née Stead); husband of Mary Stretton; brother of John (see below). Born in Southampton in the September Quarter of 1886. Died 16 October 1917 aged 31. Awarded the Military Cross. *William and Beata Stretton lost all four of their sons in the Great War. Elgar set to music some words written by William which became a popular patriotic song during the war - Follow the Colours was first performed in 1914. He is buried in the Queensferry cemetery alongside his son Conrad. The family were remembered in Salcombe by the naming of De Courcy Road. 2955 Able Seaman Conrad de Courcy Stretton of the Royal Australian Navy, HMAS "Australia". Son of Captain (Quartermaster) William de Courcy Stretton of the Royal Field Artillery; brother of Alexander (see above) and John and William (see below). Born in Gosport, Hants in 1890. Died 12 March 1915 aged 24.He died of illness aboard ship and is buried at Queensferry alongside his father. 2nd Lieutenant John de Courcy Stretton M.C of the 3rd Battalion and the 1st Battalion, the Royal Warkwickshire Regiment. Son of Captain (Quartermaster) William de Courcy Stretton of the Royal Field Artillery; brother of Alexander and Conrad (see above) and William (see below). Died 11 May 1918 aged 27. Captain William Stapleton de Courcy Stretton of the 3rd Battalion and the 2nd Battalion, the Royal Warwickshire Regiment. Son of Captain (Quartermaster) William de Courcy Stretton of the Royal Field Artillery; brother of Alexander, Conrad and John (see above) Born in Gosport, Hants in 1889. Died 4 September 1916 aged 27. 9152 Private George Stone of the 1st Battalion, the Devonshire Regiment. Son of Henry and Rebecca Stone of Liskeard. Born in Salcombe in 1893. Died 30 October 1914 aged 22. 5045 Rifleman Cecil Robert Tolcher of the 9th Battalion, the London Regiment (Queen Victoria's Rifles). Grandson of Elizabeth Tolcher of Union Street, Salcombe. Born in Rickmansworth in the June Quarter of 1897. Died 23 January 1917 aged 19. 15429 Lance Corporal John Hannaford Trinick of the 17th Tattalion, the King's (Liverpool) Regiment. Son of Richard and Mary Trinick of the Bolt Head Hotel, Salcombe. Born in Salcombe in 1896. Died 22 january 1916 aged 20. 2nd Lieutenant Richard Wake Twining of the 1st Battalion, the Devonshire regiment. Son of Vincent and Kate Twining of Allenhayes Road, Salcombe. Born in Salcombe in 1896. Died 1 july 1916 aged 21. Gazetted to the Dragoon Guards in 1914 then exchanged to the Devonshire Regiment in 1915. 2nd Lieutenant Robert Humphrey Medlicot Vereker of the 2nd battalion, the grenadier Guards. Son of George and Frances Vereker of Sharpitor, Salcombe. Born in Dublin in 1893. Died 25 August 1914 aged 27. 25432 Lance Corporal Gilbert Thomas Wood of the 9the (Service) Battalion, the Devonshire Regiment. Son of Thomas and Louisa Wood of Salcombe. Born in Salcombe in 1894. Died 4 October 1917 aged 23. Awarded the Military Medal. 10401 Private Percy Yeoman of the 8th Battalion, the Devonshire Regiment. Son of the late William and Annie Yeoman.of Malborough. Born in Salcombe in 1896. Died 25 September 1915 aged 20. PLY/1210(S) George Moore Cranch of the Royal Marine Light Infantry, 2nd Royal Marine Battalion, the Royal Naval Division. Son of the late James and Mary Ann Cranch. Born in Salcombe 10 March 1893. Died 26 October 1917 aged 24. 39555 Private James Henry Stone of the York and Lancs Regiment . Son of James and Blanche Stone. Born in South Pool in 1897. Died 30 January 1919 aged 22. Buried in Salcombe Cemetery. Donkeyman Nikol Dokom of the Mercantile Marine, SS Riversdale (Sunderland). Born in Russia in 1890. Died 28 December 1917 aged 27. Buried in Salcombe Cemetery.